Layout: Users can design product pages from the theme of their website to the structure of their e-shop. Odoo E-commerce allows users to create personal product pages to fit their business. Different themes are available on the Odoo website based on different sectors as education, services, shops, etc. or you can chose to use the default ones. Thanks to the Odoo 'edit line', it is very easy to create product pages without any coding knowledge. Promotional tools: Possibility to emphasize your best products and to add "suggested products". By offering extra products, you give more choice to your clients and increase your revenue per cart. Customer focus: The app offers the possibility to install a Live Chat to communicate directly with your customers. The easy research system and the simple check out, make the shopping easier for your customers. You can decide if the registration is needed to order on your site. Payment methods: it is fully integrated with Paypal, Ogone, Adyen, Buckaroo, Authorize.net and SIPS systems. The app can be integrated with shipping connectors such as FedEx, UPS and DHL. With the customer portal, you can give to your customers the access to a dedicated portal where they can track their orders. Odoo E-commerce can be integrated with Amazon or E-bay in order to also publish easily the products on those shops. Odoo E-commerce can be integrated with Odoo Website, Odoo CRM, Odoo Accounting, Odoo Manufacturing, Odoo Warehouse and more. Extensive ERP for a small to medium sized business. Having everything in one app is the major benefit to me. I don't have to use different software for Sales and Purchases; for Contacts; fr Projects etc. Another benefit for me is the ability to attach documents to each transaction for tax purposes at the end of the financial year.Odoo is an Opensource ERP with a free Community Edition and a paid Enterprise edition. It is packed with features like Accounting, Project Management, Customer Management, Employee & Recruitment Management, Inventory & Warehouse, Sales and Purchase and POS to name a few. I like the Dashboard where one can get an bird's eye view of the status of any task or activity that needs attention. Plenty of additional modules (called Apps) are also available on the Odoo Store. Odoo uses Postgresql as database. It offers plenty of customisation options. Some countries' standard Chart of Accounts are available by default, or you can create your own. Overall a very useful ERP. Odoo is an Opensource ERP with a free Community Edition and a paid Enterprise edition. It is packed with features like Accounting, Project Management, Customer Management, Employee & Recruitment Management, Inventory & Warehouse, Sales and Purchase and POS to name a few. I like the Dashboard where one can get an bird's eye view of the status of any task or activity that needs attention. Plenty of additional modules (called Apps) are also available on the Odoo Store. Odoo uses Postgresql as database. It offers plenty of customisation options. Some countries' standard Chart of Accounts are available by default, or you can create your own. Overall a very useful ERP. I'm reviewing the Community Edition: On the downside, it has a relatively big learning curve. Setup and initial configuration is crucial. I would have liked to choose between mySQL and Postgresql as some hosting providers does not offer Postgresql. Some minor frustrations is the fact that an invoice can only be created after a quotation, then an order. I would've liked to be able to enter an invoice without an quote or order; for example monthly regular contractual invoices. Having said that, depending on how your business work, it might not affect you that much. Secondly, recording expenses is cumbersome - expenses are recorded either through the employer expense module (which is not always related to an employer, like rent), or through billing. Either way, you need to create a "product or service" for expenses before entering them. Where and how you enter them, also affects your expense reporting. I would also like to see more reporting options like traditional desktop apps. Customer support for the Community Edition are limited to the forums and some manuals for older editions. All of my systems and customer data are centralized in one easy to use systemAs a former Netsuite and Salesforce partner, our clients demanded more in the form of ease of use, mobility and functionality without breaking the bank. We started off by migrating ourselves off of our Netsuite system. This move simplified all of our daily work lives so much, we brought this solution to our client base. From Professional Services, Manufacturing and Warehouse operations, Odoo was an excellent fit and an extremely good value. The company improves the software almost daily and with thousands of prebuilt apps in their app store, adding major functionality and workflow is simple. Also the open nature of the code makes it the absolute most flexible ERP/CRM/MRP software on the market. Odoo maintains a few versions Community(Free) and Hosted(Saas) and Enterprise(Self Hosted). We recommend either Hosted or Enterprise(Most Recommended) for business. The Community edition is mostly for developers to have an easy way to learn the basics. The Enterprise edition is packed with additional advanced features necessary for production use, and is supported by Odoo and the Odoo Partner Channel. Any company in the search for an ERP system should include Odoo in their list. As a former Netsuite and Salesforce partner, our clients demanded more in the form of ease of use, mobility and functionality without breaking the bank. We started off by migrating ourselves off of our Netsuite system. This move simplified all of our daily work lives so much, we brought this solution to our client base. From Professional Services, Manufacturing and Warehouse operations, Odoo was an excellent fit and an extremely good value. The company improves the software almost daily and with thousands of prebuilt apps in their app store, adding major functionality and workflow is simple. Also the open nature of the code makes it the absolute most flexible ERP/CRM/MRP software on the market. Odoo maintains a few versions Community(Free) and Hosted(Saas) and Enterprise(Self Hosted). We recommend either Hosted or Enterprise(Most Recommended) for business. The Community edition is mostly for developers to have an easy way to learn the basics. The Enterprise edition is packed with additional advanced features necessary for production use, and is supported by Odoo and the Odoo Partner Channel. Any company in the search for an ERP system should include Odoo in their list. Documentation needs improvement. Most documents and answers are not centralized but scattered between Youtube, and Odoo Community and GitHub although they have been building a training portal. Thanks for the review VCloud9 team! We are excited to hear how your experience with other ERP systems like Netsuite has helped to identify key value indicators when doing software implementation. We look forward to continuously adding value to your projects in the future! Odoo gives you full featured modern open source software to manage a business or any organization. One of the fastest growing, well rounded, full featured, modern, open source, business, or other organization, management software. * A free community version is available at no cost forever, with about 85% of the features of the paid commercial version. * Very powerful software for organizations of 1 or 2 people, up to hundreds, possibly thousands of employees. * Full accounting including customized international accounting which works in about 100 countries, impressive. * Full website builder lets you drag and drop blocks on the screen to setup your org's website. * Comes with a feature where you can offer live chat support to your customers or audience. * Connects to your bank account in the paid version for automatic verification of account activity. * Manages multiple bank accounts for the various parts of the organization, nice. * Full automation of the employee recruitment, interview, hiring, employment contract, and termination process. * Management of the vehicle fleet or any other set of assets belonging to the organization. * Manufacturing Resource Planning modules are available if you're running this type of organization. * Email app is great and a huge time saver, it becomes a high speed task manager and filter. * Point of sale app is also really cool, from a tablet or phone you can access the minimal set of functions in Odoo needed to check customers out at the point of sale, the great thing is the Point Of Sale can keep running taking payments and tracking which items are sold and their quantity, even when internet access disconnects, then when internet connection comes back, the app will save the completed sales into your Odoo system. * Between 50 and 100 apps. * You can use all the community apps for free. If you choose to subscribe to the commercial Odoo, it's a cheap price per month per app, which comes with support and hosting if you want it. Pricing is way lower than the competition. Even running the free community version although limited it's far better than running a business without software or with many disjointed separated software. * Odoo really delivers on the do-it-all approach, every app is able to talk to all the other apps, and share information, because they all run on top of the same set of your company's data. This totally eliminates the need to connect separate apps made by different companies, or worse, re-enter the same data into multiple different apps, losing tons of time and money. No data re-entry. All the apps are connected and share information. Saves so much time and money. Also, you can create your own modules, or hire an outsider to create a module for you, due to the open source nature of the software. Easy to add any of the pre-made apps. No data re-entry. All the apps are connected and share information. Saves so much time and money. Also, you can create your own modules, or hire an outsider to create a module for you, due to the open source nature of the software. Easy to add any of the pre-made apps. It can run slow, if you don't take a little time to tune up the server it's running on, and use enough memory, caching, and ideally an ssd. There's a lot of database access happening. Upgrading to the new version is not easy. It would be great if the Odoo company would make upgrading a simple do it yourself automatic task, one click of a button, that would not require human attention for 2 weeks. There's an entire article with more about this on the Odoo site. Thank you for your review Chris. We appreciate you taking the time to provide us with your valuable feedback. It is the most complete ERP with the best support and the largest community and continues to grow. Undoubtedly the best proposal for small and medium-sized companies because of its relatively low costs compared to all the characteristics it has. It is the most complete ERP with the best support and the largest community and continues to grow. Undoubtedly the best proposal for small and medium-sized companies because of its relatively low costs compared to all the characteristics it has. Its easy use and the integration of all its modules make it the perfect tool for any company that needs to manage its processesIt is a complete business suite that allows the management of multiple applications for managing the processes of a company. It has a friendly interface and has easy handling and configuration in all its modules. all applications handle information in an integrated manner. Integration among all its modules that facilitate its usability. It has a very large community of users and with the best support for this type of applications. It has the best prices in the market and even has a free version for small businesses. undoubtedly has the best price quality ratio among all software of its kind. It is a complete business suite that allows the management of multiple applications for managing the processes of a company. It has a friendly interface and has easy handling and configuration in all its modules. all applications handle information in an integrated manner. Integration among all its modules that facilitate its usability. It has a very large community of users and with the best support for this type of applications. It has the best prices in the market and even has a free version for small businesses. undoubtedly has the best price quality ratio among all software of its kind. because it is designed to touch all the areas of management of a company, it has some areas with some weaknesses regarding the competition such as human resources, payroll and adjustments in the configuration of some countries that do not have a lot of presence in their community. Although it is very intuitive and is designed to facilitate user use, knowledge must be available about the processes in question in order to exploit the full potential of this suite. Odoo E-commerce requires the use of Odoo Invoicing and Odoo Sales, both at $15/month and Odoo Website at $25/month. For companies with less than 50 people, Odoo recommends the Online Edition. This cloud version is hosted on Odoo servers. For this service an extra fee of $25/user/month is added. For companies with more than 50 users, the On-Premise version is recommended. Odoo On-Premise is deployed locally. The Enterprise version of the On-Premise product is the most complete. Increase your average cart revenue. Personal customer portal: shipping status, invoices, delivery orders. Multiple integration with shipping companies. Integrated with other Odoo apps. Below are some frequently asked questions for Odoo eCommerce. Q. What type of pricing plans does Odoo eCommerce offer? Q. Who are the typical users of Odoo eCommerce? Q. What languages does Odoo eCommerce support? Q. Does Odoo eCommerce support mobile devices? Q. Does Odoo eCommerce offer an API? Yes, Odoo eCommerce has an API available for use. Q. 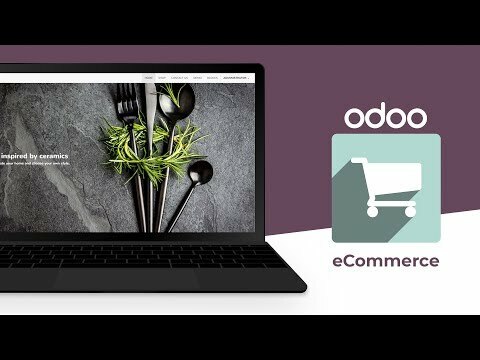 What other apps does Odoo eCommerce integrate with? Q. What level of support does Odoo eCommerce offer? Q. Which apps is Odoo eCommerce compared to most often?